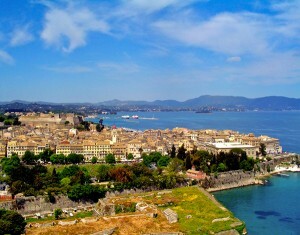 Corfu town as seen from the Old Fortress. Photo courtesy of Greek Tourism. Corfu, one of the greenest and prettiest of the Greek islands, is also the best fortified. The two massive stone fortresses overlooking Corfu town succeeded in keeping the Ottoman Turks out. Both the Old Fortress and the new one were built by the Venetians, who ruled the island for more than four centuries. The Venetians also left their mark on this Ionian isle in still-extant multistory gabled houses packed tightly together, their arched colonnades lining flagstone-paved lanes. Jews have lived in Corfu at least since 1160. They came first from the Balkan peninsula, from Romaniote (Greek-speaking) communities. They were persecuted by both Byzantine and Anjou rulers, but in the 14th century they obtained some rights, including documents of protection and exemption from most taxes. They owned land, including vineyards. They prospered under Venetian rule (1386-1797), lending money to the Venetian rulers, provisioning the army and even joining the ranks. They also financed public works, including construction of a bridge. But the local inhabitants kept attacking them, and in 1622 the doge ordered the Jews to move to a ghetto for their protection. During the Turkish siege of 1716, Jews contributed to the Venetian war effort and two were noted for their bravery. August 6, the date the siege ended, was celebrated in the synagogue. After the expulsion of Jews from Spain and Portugal, some settled in Corfu. They and Jews expelled from Naples joined the small Italian community, which was mainly from Sicily and Apulia. Until World War II, there was constant friction between the Romaniote and Italian Jews in Corfu; they even maintained separate cemeteries. The two joined forces only for a few charitable or economic causes, for example, redeeming Jewish captives held for ransom in Malta. Until the 15th century, Jews lived within the Old Fortress, as did other residents, but later were forbidden to worship there. Newcomers lived outside the fortress in an area called Jews’ Mountain. During the Venetian period, Jews exported cotton, salt, wine, olive oil, etrogs, silk and gold fabric and works of art. They were also bankers, doctors and clerks. 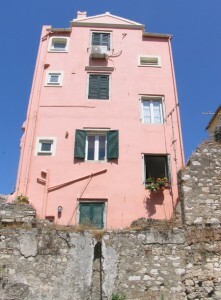 A building in the old ghetto. Photo by Esther Hecht. Jews had close ties with the Land of Israel; in the 19th century, they collected money to buy land near Hebron. Corfu was a center of Torah learning and of the composition of liturgical poems, but most of the leading rabbis originally came from elsewhere. When Napoleon conquered Corfu in 1797, he gave the Jews equal rights. More Jews came from Italy and the Ottoman Empire, and by 1802 the community had grown to 1,229 (of 45,000 inhabitants). But when Corfu became a British protectorate in 1815, though cultural life blossomed and magnificent buildings were erected, the Jews lost their civil and political rights. In 1856, a blood libel led to continuing attacks by Greeks. Nevertheless, Jews supported the unification with Greece in 1864, following which they received equal rights. Three Jews joined the city council, one became a mayor and one became a deputy mayor. But the new prosperity and political activity of the Jews aroused resentment, and a second blood libel was spread in 1891. A month-long pogrom ensued, which the authorities tried to control by keeping the ghetto under curfew. After this, about one-quarter of Corfu’s Jews immigrated to other parts of Greece and to Turkey, Italy, Egypt and England. Two blood libels, in 1915 and 1918, caused additional emigration. In the early 20th century, Zionist organizations were established and some Jews left for Palestine. On the eve of World War II, Corfu had 2,000 Jews, two-thirds in the Italian community and one-third in the Romaniote. Under the Italian occupation, from April 1941 to September 1943, the Jews were relatively safe. But then the Germans invaded. By April 1944, they had lists of all the Jews, who had to attend frequent roll calls on the Spianada (esplanade). On June 9, some 1,800 Jews were brought to the Kato Plateia (lower square) and then held nearby in the Old Fortress, where they were forced to hand over their valuables. By June 17, all had been transported by sea and land to Athens. From there they were taken by train to Auschwitz, where 1,600 were immediately sent to the gas chambers. The few survivors were joined in Corfu by survivors from other places, in total 185 souls. By 1948, there were only 125 Jews, and by 1958 only about 85. La Scuola Greca. Photo by Esther Hecht. Lino Soussis, 62, who headed the community until recently, remembers joyful Passovers in his parents’ home, with many Jewish sailors from the United States Sixth Fleet as guests. His mother prepared panada (pieces of matza in beef broth), pigadinio (minced meat pie made with matza) and pasta di mandorle (a creamy almond paste). But bitter memories loom in the community’s consciousness. Moshe Velelis, 57, the current community head, has a clothing and textile shop in the former ghetto just a few yards from the synagogue. He keeps at the shop the striped shirt his father wore in Auschwitz. In 2011, clerics and politicians denounced a Passover arson attack on the synagogue that destroyed some prayer books, but it was a reminder that anti-Semitism persists. Corfu has some 60 Jews, including doctors, engineers, mathematicians and businesspeople. “There was also a prostitute, but she died,” Soussis says. Only a few Jews live in the ghetto, but the area is still called Evraiki (Jewish). The community celebrates Passover together with a Seder and services, and a cantor from abroad leads High Holiday prayers in the synagogue, but there is no regular minyan. The last Jewish wedding was that of Velelis, in 1993. The last brit mila was the same year. 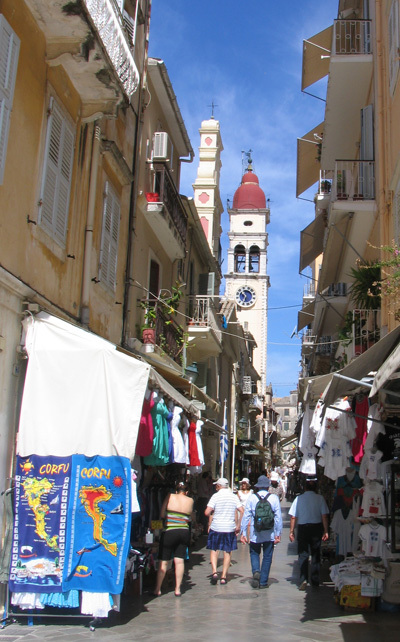 Corfu town is a delight for walkers; but if your feet are tired, try a horse-and-buggy ride. Starting from the southern end of Eleftherias Street, walk along the Liston promenade, with its row of cafés overlooking the Old Fortress and the greenery of the esplanade. At the northern end of Eleftherias stands the Asian Art Museum (011-30-26610-30443), formerly the Greek king’s winter palace. It was on the Kato Plateia, the square between the cafés and the Old Fortress, that the Germans ordered the Jews in the spring of 1944 to report for roll calls and gathered them prior to deportation. Turn left from Eleftherias on Agios Spyridon Street, passing the Church of Agios Spyridon, the patron saint of the island. Outside the church is a bust of the late Bishop Methodius, who used to attend all holiday services at the Greek synagogue. Alley shopping in Old Town. Photo by Esther Hecht. Proceed to Solomou Street, which was the northern boundary of the ghetto. The other boundaries were Palaiologou Street (east), Voulgareos Street (south) and Scholembourg Street (west). From Solomou turn right on Agia Sofia Street. A red sign there points to the Old Fortress and to the synagogue. Just opposite the sign is Velelis’s shop. Of the four synagogues that existed in the ghetto before World War II, only the Greek one—La Scuola Greca—remains. Next door lie the ruins of the Talmud Torah. The synagogue (open daily 10 to 4; Velisariou Street) is a yellow stucco, two-story structure with a gabled roof, built in the 18th century. In June 2002, 58 years after the deportation of Corfu’s Jews, a memorial plaque that bears their family names was placed inside the synagogue. Like Venetian synagogues, the sanctuary here is on the upper floor. Baroque gilt-topped pillars support the entablature and dome above the Ark, which is surrounded by a wooden balustrade with an elaborately carved gate. 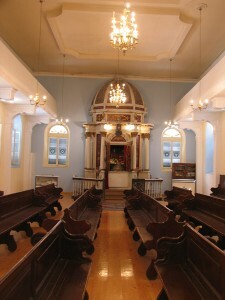 As in Venetian (and also Romaniote) synagogues, the Torah is read at the rear of the rectangular sanctuary from a teiva, or raised podium, with four columns supporting a cupola and richly gilded carvings. The benches run lengthwise so that, as Soussis explains, worshipers need not turn their backs on the Ark. According to Greek mythology, the Gorgon Medusa angered the goddess Athena, who turned her into a monster with writhing snakes instead of hair. The Gorgon and her children—Pegasus (the winged horse) and Chrysaor—appear on a striking 6th-century-B.C.E. pediment, the oldest stone pediment in Greece, in the Archaeological Museum (1 Vraila Armeni Street; 30-26610-30680). Continue south on Dimokratias to Mon Repos (30-26610-41369; www.corfu-town.com/mon-repos.htm), the palace where Princess Alice of Battenberg gave birth to Prince Philip, the consort of Great Britain’s Queen Elizabeth II. The neoclassical villa was built in 1831 on the site of the ancient city Kerkyra. Now it is a museum with period costumes and furnishings and an interesting collection of early photographs of life on the island. It is surrounded by a 250-acre park containing many antiquities. In 1993, Yad Vashem in Jerusalem honored Princess Alice for having hidden Rachel Cohen and two of her children in Athens from the end of 1943 until liberation. In 1994, Philip and his sister, Princess George of Hanover, planted a tree at Yad Vashem in their mother’s honor. It was the first visit of a British royal to Israel since 1948. Alice died in 1969 and was reinterred on Jerusalem’s Mount of Olives in 1988, in accordance with her wishes. From Mon Repos return to Corfu town and proceed six miles southwest in the direction of Gastouri, where, in 1890, the beautiful and strong-minded Empress Elisabeth (Sissi) of Austria built a summer residence she named Achilleion (30-26610-56245) and filled it with sculpture and art related to the Homeric hero Achilles. She also displayed a full-size sculpture of the German Jewish poet Heinrich Heine, whom she admired. But when the German Kaiser Wilhelm II bought the palace after her assassination in 1898, he did not want the statue. Heine’s publisher and friend Julius Campe brought it to Hamburg. The city refused to display it until 1956, when it was finally erected in town hall square. The brightly lit church of Agios Dionysios beckons to visitors arriving at night by ferry to Zakynthos, the southernmost of the Ionian islands. In gratitude for the islanders’ help during World War II, the local Jewish community donated the stained-glass windows of the church. Jews lived on the island from at least the start of the 15th century and had strong commercial and family ties with the Jewish community in Corfu. The Germans occupied the island in 1943, appointed Lucas Karrer mayor and demanded a list of the Jews. Instead, Metropolitan Chrysostemos Dimitrious bribed the German commander, and the partisans threatened to attack. Bishop Vassily Stravolmos wired Hitler, asking him not to deport the Jews. The Germans again demanded a list. This time they received one, but it bore only two names: Karrer’s and the metropolitan’s. When the Germans nevertheless brought boats to deport the Jews, Karrer told them to flee, and nearly the entire community was saved. After the war, most left for Palestine, some illegally in 1946 on a ship named the Henrietta Szold. The Shalom Synagogue, at 44 Tertseti Street in the city center, was destroyed by the 1953 earthquake that effectively put an end to the Jewish community. Busts of Karrer and Chrysostemos appear on two marble scrolls, and a plaque expresses gratitude to them and the people of Zakynthos. To reach the Jewish cemetery, take Tertseti north (it becomes Kolyva Street), turn left on Verikiou Street and right on Filikon Street. The cemetery is off Filikon, next to Agiou Georgiou Filikon Church. Lawrence Durrell, his brother, Gerald, and other members of their British family moved to Corfu in 1935. Prospero’s Cell: A Guide to the Landscape and Manners of the Island of Corcyra (Corfu; Axios Press) is Durrell’s coming-of-age memoir. He was married to Eve Cohen, of Alexandria, and later to Claude-Marie Vincendon, a descendent of the Montefiore family. Naturalist Gerald Durrell wrote about the period in Corfu in a comic account, My Family and Other Animals (Penguin). The story was adapted for television, and filmed on location in Corfu. It ran in America on PBS’s Masterpiece Theater. Farewell My Island (www.act1presentations.com), a brief documentary by Isaac Dostis, relates the roundup and deportation of the Jews from Corfu and includes survivor testimonies (in Greek, with English subtitles). It is 22 minutes long, precisely the time it took to get from the roundup area to the deportation barges. Dr. de Mordo (1744-1823) supported Corfu’s union with Greece. He founded the first Greek doctors association and published a Greek guide to the island’s flora. Novelist and playwright Albert Cohen (1895-1985), who lived most of his life in Geneva and wrote in French, was born Avraham Cohen in Corfu. The family left for France in 1900. A large plaque on the synagogue’s outer wall bears the inscription: “A child was born in this neighborhood and here he took his first steps. That child was Albert Cohen.” He is the author of a trilogy about the Jews of the Ionian island of Kefalonia, but the novel that is considered his masterpiece, Belle du Seigneur, is set in Geneva in the 1930s. It appeared in English as Her Lover (Penguin). French singer and songwriter Georges Moustaki was born in Alexandria to parents who came from Corfu. Two of his songs are said to have become resistance hymns to the Greek military junta. Corfu is reachable by air (often via Athens) or by ferry from Albania, Italy or mainland Greece. Bella Venezia is a boutique hotel with superb service, within walking distance of the synagogue and Corfu town’s important sights. Guests enjoy breakfast in a delightful, flower-filled garden (4 N. Zambeli; 30-26610- 46500; www.bellaveneziahotel.com). Coffee drinking seems to be the national sport. Back-to-back cafés line the Liston, where Greek coffee is the cheapest thrill. Corfu has no kosher restaurants, but pasta dishes, fish and salads are plentiful. Marina’s, a small restaurant in the ghetto, has excellent choices—such as a fresh spinach salad with grilled mushrooms—at reasonable prices (4 Agias Sofias Alley, corner of Velisariou; 30-69816-56001). Having dined, wander the bazaar-like streets of the Old Town and fill your souvenir bag with olivewood items, a bottle of olive oil and some kumquat preserves. To enjoy the island’s natural beauty, drive north on the coast from Corfu town, for example to Kalami Bay, where Lawrence Durrell lived in the White House that’s now a restaurant. Continue north to Acharavi to reach the peak of Mount Pantokrator, at 2,972 feet the highest on the island. Or cross the island from Corfu town to the resort town of Paleokastritsa. Just north of Paleokastritsa is the village of Lakones where, on the main road, you will find Dolce (30-26630-49278), the ultimate café in the mountains, overlooking brilliantly blue coves with sandy beaches. Listen to the mellow jazz, order some Greek coffee and baklava and let their sweetness flow to your fingertips as you relax in the most glorious of Corfu’s beautiful spots. Esther Hecht blogs at estherhecht.wordpress.com. Thank you for the very interesting article!Wished the synagoge we visited lately would have such a written information about the sad history about the jewish community in corfu. I would like to add something we discovered in a wall opening near the new fortress(not far from the market.The street is called “Lochagou Spiridonos Vlaikou” The big stone above the entry has hebrew letters engraved.I assume it was a gravestone taken from a jewish graveyard.